Although French polish is the general term for all types of Shellac Polish, it is also a product in its own right. 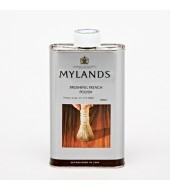 Mylands range contains many blends of Shellac Polish which have been developed over the years to fulfil various different requirements – some of which are slightly modified products for a specific purpose. They come in various depths of colour, which give the French Polisher latitude to choose the most appropriate product for the timber being polished. Shellac products have a variety of uses from finishing antiques and reproduction furniture to acting as a barrier between two normally incompatible finishes. They are particularly useful when refurbishing furniture as they will seal in any wax product which may have been applied to the furniture in the past.